My college campus had what might be called a “token conservative” newspaper. Its general tone seemed, in hindsight, to be that of running prank, as if they knew they were expressing a minority opinion that was unlikely to gather a friendly audience, so they figured they might as well go all out and generate as much outrage as possible. At times, it seemed like they were being contrary for its own sake; for example, their issue before Columbus Day. The university did not count this as a holiday, and did not cancel classes for it. Stating their intent to boycott class that day, they defended Columbus’s legacy as an accomplished explorer who deserved to be celebrated, and the idea that he was a slave driver or bloody conqueror they brushed off as mere revisionism. At the time, I was pretty well aware of the facts supporting the darker side of Columbus’s expeditions. There is primary source attestation to conquest, enslavement, and other atrocities. So this was a strange objection to me: what is wrong with revising an outdated account to bring it in line with the evidence? Now, this seems even stranger since I’m aware that revision is something academic historians do all the time. There are “revisionist” schools of thought on historical events, meaning only that they challenge a long-established orthodoxy. 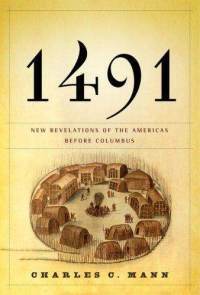 In this sense, the subject of my last book review could be seen as a positive example of revisionism: in 1491, Charles Mann refutes various long-held myths about the history of the Americas before European contact and summarizes new lines of research. But on the other hand, there is a kind of revisionism that does deserve to be used as a slur, and which it seems is much better known. Revisionism here is not really a process of revision at all, but distortion for an agenda. I recently wrote about an example of this playing out in the media. It might be worth looking at a slightly more sophisticated example of the form than a hasty retroactive defense of a political celebrity. It’s not just the desperate and the inane who abuse history to suit their own ends. Sometimes, very smart and knowledgeable people apply their intellect to the purpose of historical propaganda. My subject today is An Empire of Wealth: The Epic History of American Economic Power (Amazon link) by John Steele Gordon, a sanguine look at American economic history which studiously avoids letting the eye stray to some very ugly places. Charles C. Mann would like to let you know that almost everything you know about the Americas before European contact is wrong in 1491: New Revelations of the Americas Before Columbus (Amazon link). Mann is a journalist who, after learning bits and pieces of new research into pre-contact American history, decided to summarize these findings. He draws from history, archeology, anthropology, ecology, genetics, linguistics, and many other fields to present a detailed but high-level overview of this untold history. Last Friday, the long-delayed, nearly fabled, movie adaptation of Ayn Rand’s magnum opus Atlas Shrugged was released, to less than rave reviews. Yet, as Roger Ebert noted, the movie got a four star rating from readers on the internet before it had been publicly released. Rand’s epic clearly has a certain power to fascinate. It’s even ensnared me: as left-leaning as I am, I can’t help having a soft spot for Atlas Shrugged, in the way that bad movie buffs think fondly of Plan 9 from Outer Space. I read it several years ago, and felt as if I had discovered a sort of master codex to the dysfunction of American politics. I’m putting my ideological cards on the table so that the reader will be able to gauge what size grain of salt to take this with, in case the title was not warning enough. If I seem overly biased against the author on ideological grounds, let me say that I think Rand was a competent writer of nonfiction. A very bad storyteller, given the odd placement of a detailed and well-written tract explaining her philosophy near the climax of a novel and unconvincingly passed off as character dialog, but the infamous Galt Speech was serviceable at clearly explaining her ideas. The issue that brings me to the keyboard today concerns a suspicion I have had ever since reading the Galt Speech, the seed of an insight which grew more and more plausible as I thought back over the events of the novel. This blooming suspicion cast its shadow beyond the novel the more I read about Ayn Rand, her life and ideas, the much remarked-upon pseudo-cult that formed around Rand in the 1970s, and her adolescent crush on a child killer. These are often treated as “exceptional” items in Rand’s biography, unfortunate extremist phases or passing fancies. I can’t accept these excuses, though. My suspicion is that these episodes are integral to Rand’s entire worldview, in ways unrecognized by most commentators, and probably by Rand herself. The more I think about it, the more I realize that in terms of theme, the only thing separating Atlas Shrugged from The Iron Dream is irony. Ayn Rand was one of the great stifled totalitarian dictators of the 20th century. Janet Abu-Lughod’s Before European Hegemony: The World System A.D. 1250-1350 (Amazon link), tells the story of globalization before globalization, of a system of international trade that predated industrial capitalism, centered on the Indian Ocean, and in which Europe was at the periphery and the Americas were unknown. Rather than writing a tightly-focused study of a specific historical circumstance, Abu-Lughod takes the ambitious approach of studying the economic history of all of Eurasia over (title notwithstanding) several centuries. While flawed in some respects, it is a worthwhile and interesting read. It is, however, a challenging book for the student of history. Written as a sociological text with an historical focus, it lacks rigor in its citations, which unfortunately has the effect of making the book fascinating but suspect. The standard for citations she uses makes it difficult to trace her sources: she occasionally uses an inline notation indicating an author, year of publication, and page range, which the reader must cross-reference with the bibliography. Quite often, though, no citation is given for some of her claims. This would not be so bad if Abu-Lughod were completely reliable, but some of her unsourced claims are either extraordinary and suspicious (e.g., that Muslim navigators from the Middle East may have visited the Americas) or flatly mistaken (e.g., that the Battle of the Golden Spurs was fought between the French and an English invasion force aided by local militias of Flemish commoners), leaving the reader with a sinking sense of uncertainty. But in fairness, these unsourced claims are mostly parenthetical, or marginal to the overall point. When Abu-Lughod carefully quotes and cites her sources, and writes about the central focus of her analysis, her book can both inform and amaze; she frequently goes into impressive detail and makes thought-provoking connections and comparisons. 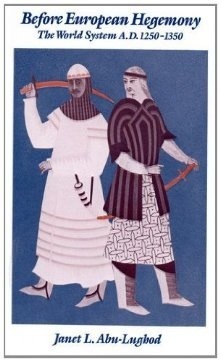 Abu-Lughod describes what she calls a “world system,” an integrated system of trade and cultural exchange that connected almost all the major societies of Eurasia in the high middle ages, as an analog to the modern Eurocentric world system created by European colonialism and capitalism. Her narrative focuses on a series of cities from Europe, to Central Asia, through the Middle East, along the Indian Ocean, and terminating in China, all of which participated in this exchange and were (directly or indirectly) connected with each other. While this leaves a lot of ground uncovered (for example, little is said about Africa, Japan, or northeastern Europe, not to mention cities nearby to her foci), a truly comprehensive study could probably take up many volumes. The sketch she outlines is detailed enough to make her point.